3-2-1, Rattle Battle! (aka Atsui 12-Game: FuriFuri Party! in Japan) is a collection of twelve minigames that generally revolve around players shaking the Wii Remote in order to score points. 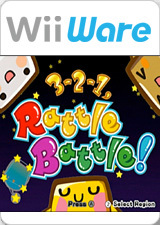 Controlling a blue cartoon mascot named "Rattle Hero", shaking the Wii Remote causes him to perform a different action depending on the minigame. These includes firing a laser beam to dispatch enemies, bouncing up and down to weigh down a scale and growing or shrinking in size to dodge a salvo of arrows. Each minigame lasts between just three seconds to around two minutes in length. The graph below charts the compatibility with 3-2-1, Rattle Battle! since Dolphin's 2.0 release, listing revisions only where a compatibility change occurred. This page was last edited on 18 February 2018, at 05:14.